Cover shows some wear. Inside pages are very nice and clean. Thousands of listings of farmers across Henry County, Illinois.
" 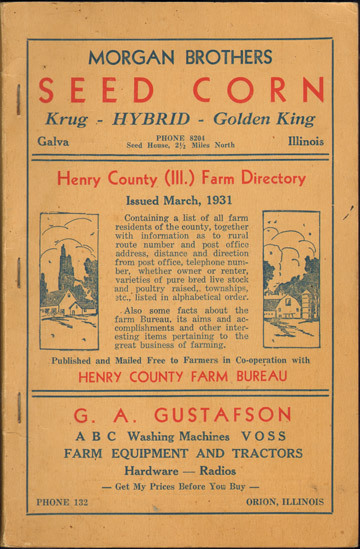 Containing a list of all farms residents of the county, together with information as to rural route number and post office address, distance and direction from post office, telephone number, whether owner or renter, varieties of pure bred live stock and poultry raised, townships, etc., listed in alphabetical order." Includes the communities of Annawan, Bishop Hill, Cambridge, Colona, Galva, Geneseo, Kewanee, Orion, Woodhull and numerous additional locations.